I’m not using portable apps yet but I plan on doing so in the future. I like the idea of having all my favorite apps configured and ready to use as I expect them regardless of the host I’m working on. I’ll start keeping track of portable apps. 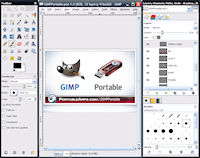 GIMP Portable 2.6.4 has been released. GIMP Portable is the full-featured GIMP image and photo editor bundled with a PortableApps.com launcher as a portable app, so you can edit your photos and images on the go. This new release updates the included GIMP to the latest release. GIMP Portable Help, GIMP Portable Background Window and GIMP Portable Photoshop Layout are also available. It’s packaged in PortableApps.com Format so it can easily integrate with the PortableApps.com Suite. Best of all, it’s open source and completely free. 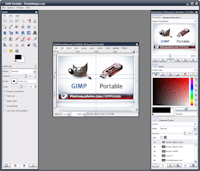 Two extras that enhance GIMP Portable are also available: GIMP Portable Photoshop Layout and GIMP Portable Background Window. The Photoshop Layout add-on adjusts GIMP’s dock/toolbox to more closely approximate the layout of Adobe Photoshop. The Background Window plugin allows GIMP to occupy a single window. The background plugin does contain known bugs and is unsupported but should still be useful to many users.